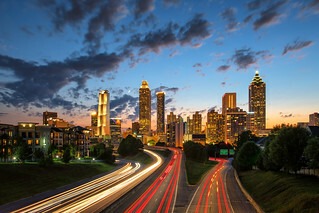 Sunset over the Capital City of Atlanta, GA. The Jackson Street Bridge is probably the busiest photographic location in the city. On almost any given night you will find a group of people gathered to photograph the city, have their picture taken with the city in the background, or just to take in the view. You can't really beat it.